I think the first time I paid attention to “Developments in Aviation” was when I saw the October 1949 edition of the National Geographic show up at our house (it helped that my two teacher grandmothers had taught me to read at age 4). I was amazed at all the color photos of the incredible airplanes. Most prominent was an orange airplane. 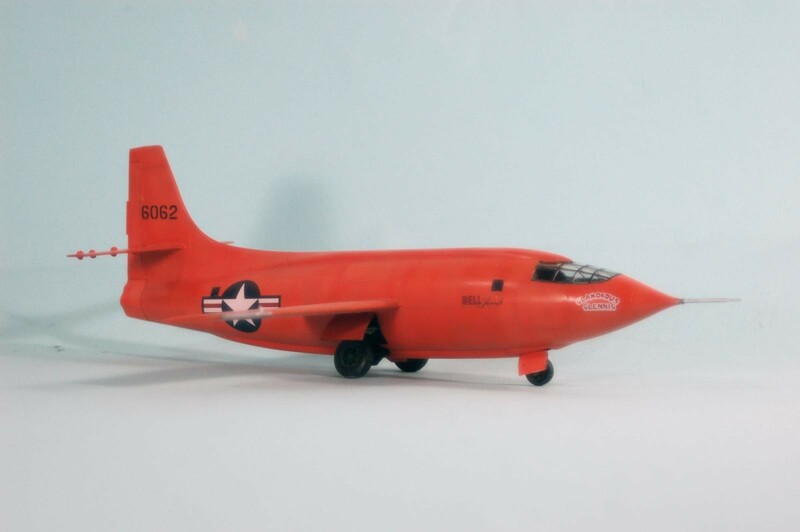 The Bell X-1. And even more interesting was the guy in the photos. 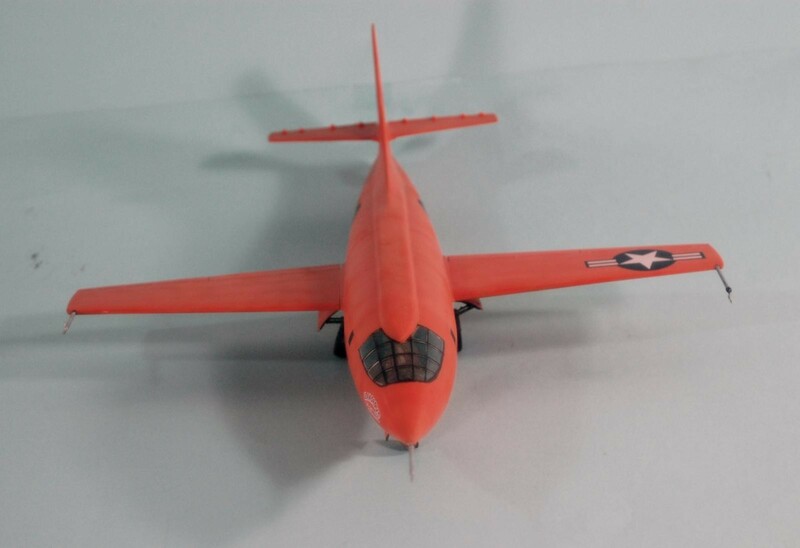 Chuck Yeager. A few years later I read about him surviving an emergency in another really fast airplane. He was easily my childhood hero. 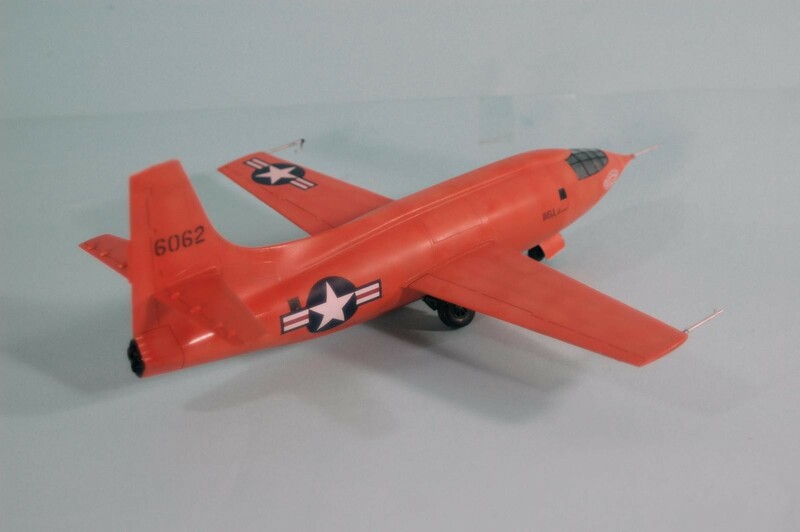 Development of the X-1, beginning in 1944, could be taken as the first signal of the diverging interests of the U.S. and Great Britain. 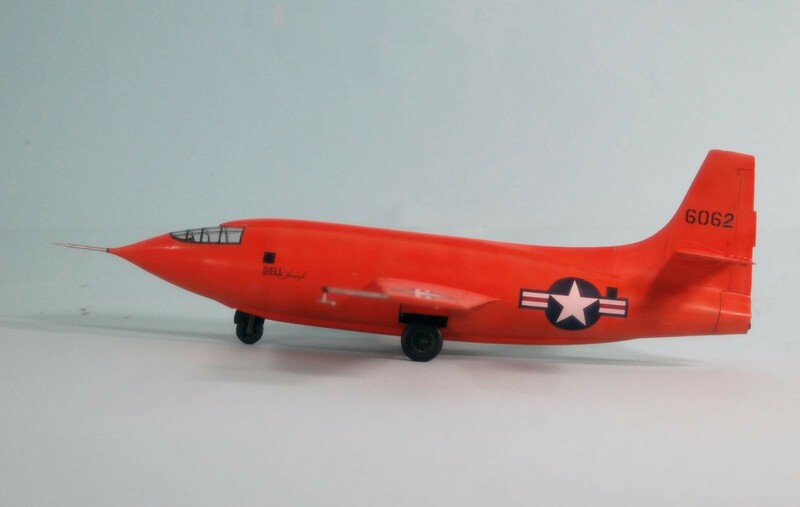 The British had commenced developmental work on a supersonic turbojet-powered airplane in 1942. 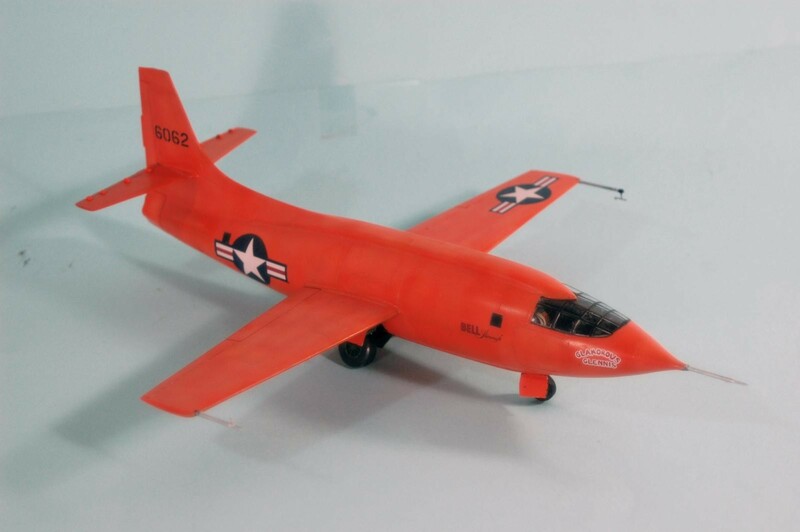 In 1944, it became the Miles M.52, with a projected maximum speed of 1,000 mph. That year, the US and UK agreed to share data on supersonic flight. The British provided information on their research into a “variable incidence tailplane” with representatives of Bell Aviation. Bell never replied with their research and at the end of 1944, the British discovered that Bell was working on a rocket-powered supersonic design of their own. They discovered in 1945 that Bell was working to include a variable incidence tailplane in the design. 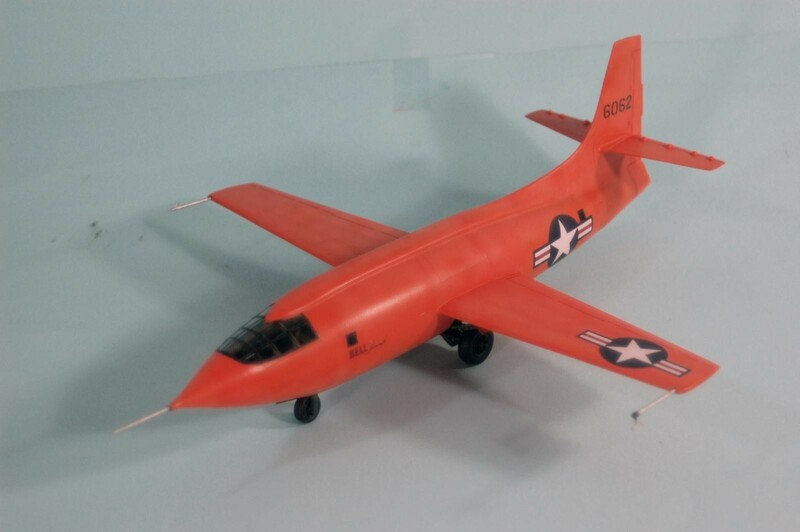 The X-1 was designed around the .50 caliber bullet since it was known that the bullet did achieve supersonic speed. The company estimated that with this design, they could achieve a speed of approximately 800 mph. 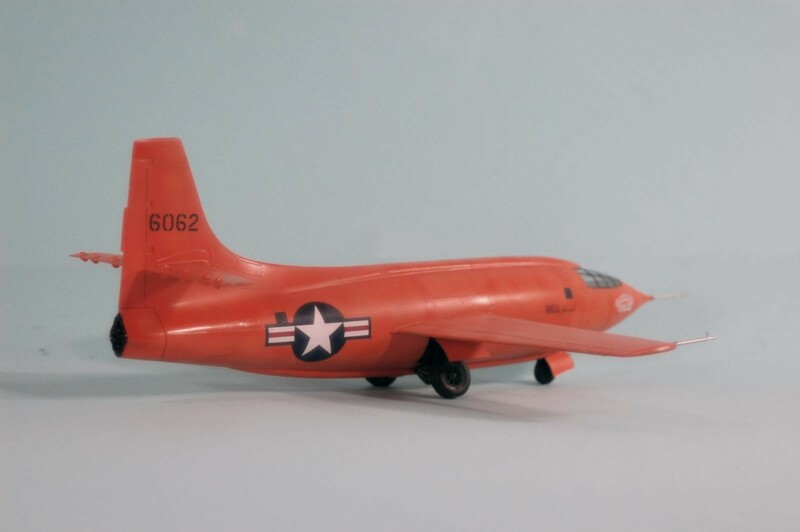 Bell made nine glide tests of the airframe in 1946 before the Air Force took over the effort, declaring the company was too conservative in their approach. Yes, it’s true (he told me so), Yeager really did bust his ribs riding a horse into the fence at Pancho Barnes’ “Happy Bottom Riding Club” outside Muroc Flight Test Center. And yes, he did use a cutoff broomstick to lock the door on his October 14, 1947 flight into history. Two weeks later, the Ladd Company press guy called me to ask if I would like to work on the movie, as Chuck’s assistant. “He’d like to have someone he can talk to who understands things.” No problem! Of course! He really was the “best stick ever.” I went flying with him in his Bonanza twice and it was like flying on glass. I had to look outside to know we’d actually touched down, he was so smooth. He took a shine to me. I had an Air Force high altitude card from my flight with the Wild Weasels (best roller coaster ride ever!) that was still valid, and so he asked me along on a flight in an F-5F over at Northrop (when he was testing the F-20 for them) that had us out west of Santa Catalina when the mach meter atop the instrument panel in the back seat went “bump” and registered Mach 1.02 for a moment. We landed back at Palmdale and he asked how I liked the ride. I just grinned. The next year he was Official Bartender for the American Fighter Aces Association Convention, the best aviation weekend I ever had. With “the good housekeeping seal of approval” from Chuck, I met all the other guys I had spent my life reading about. Got drunk as a skunk at a table with Adolf Galland, Walter “Count Punski” Krupinski, Gunther Rall and Hub Zemke (listening to the two of them kid each other about Zemke shooting off Rall’s thumb and him nearly bleeding to death and they were good friends was “memorable”), Robert L. Scott Jr (who told me my article on Yeager was “the best story about a fighter pilot I’ve ever read” – I treasure that with my yet-to-be-awarded Oscar), my old friend Jimmy Goodson and Yeager was a night to remember. 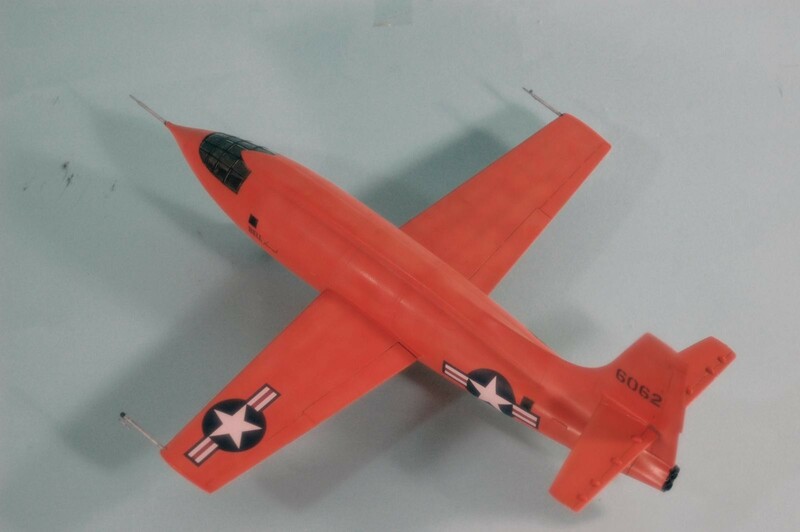 The movie made a full-scale mockup of the X-1. I once tried to get into it, but my lanky 6′ size had me stuck halfway. Yeager at 5’6″ found it a tight fit. There was no way out of that airplane in an emergency. An attempted bailout through that side hatch would have had the pilot sliced in half by the wing. Unfortunately, the dark side of my childhood hero took over after the death of Glennis. And then he married the harridan from H e l l, who I am not going to name here since she cruises the net and I am not interested in dealing with her. She’s responsible for the fact he’s no longer friends with his oldest friend, C.E. “Bud” Anderson. You can read the whole sad story here: https://www.sfgate.com/entertainment/article/Chuck-Yeager-is-in-love-Three-of-his-kids-doubt-2821681.php – yeah, a sad end to a great life. The last I heard a year ago, he’s deep in Alzheimer’s, truly the worst way for someone like him to end up. One hopes the harridan will prove herself human and stick with him to the end. Be careful what you ask for when it comes to meeting your childhood hero. 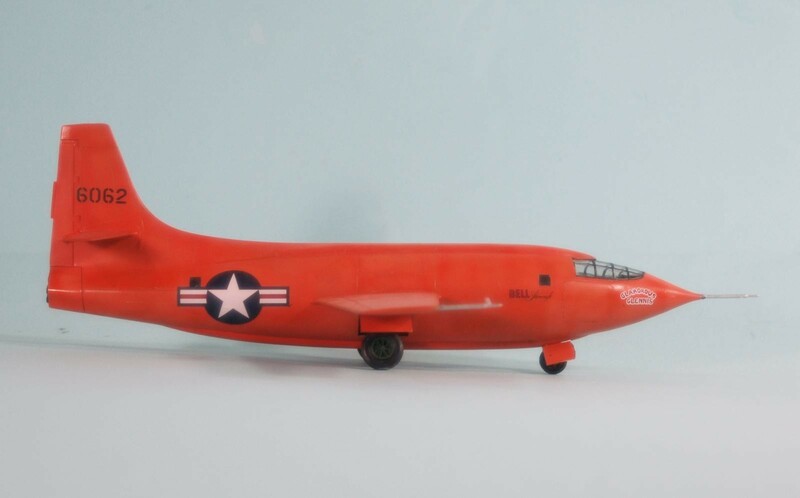 The Revell 1/32 X-1 first came out in 1998. 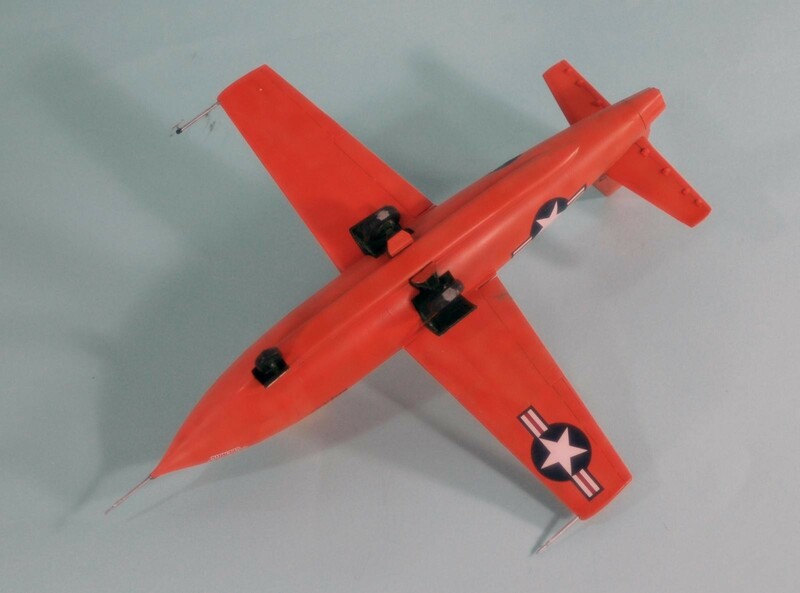 The kit is simple and easy to build and largely accurate, though it lacks the control housings on the horizontal stabilizer that I scratchbuilt for this kit. 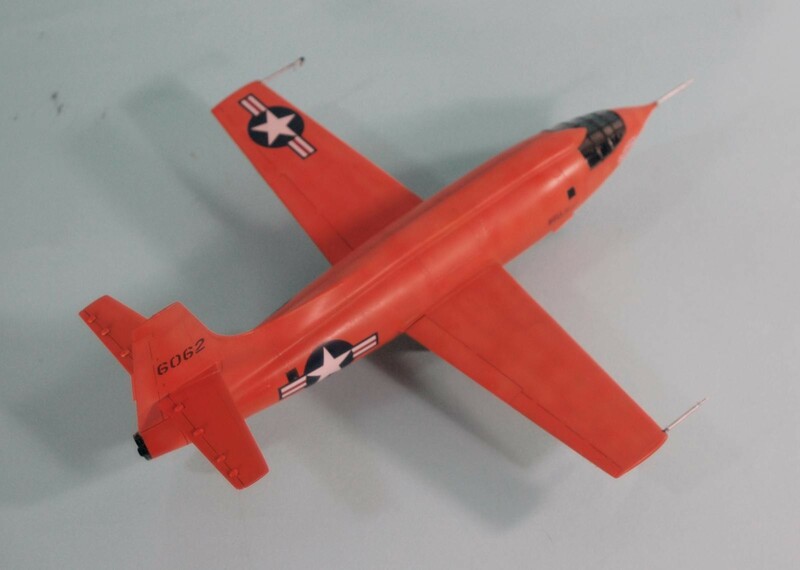 That variable incidence tailplane the X-1 proved was first installed on the F-86E Sabre, giving it the ability to “bust Mach” with complete control. 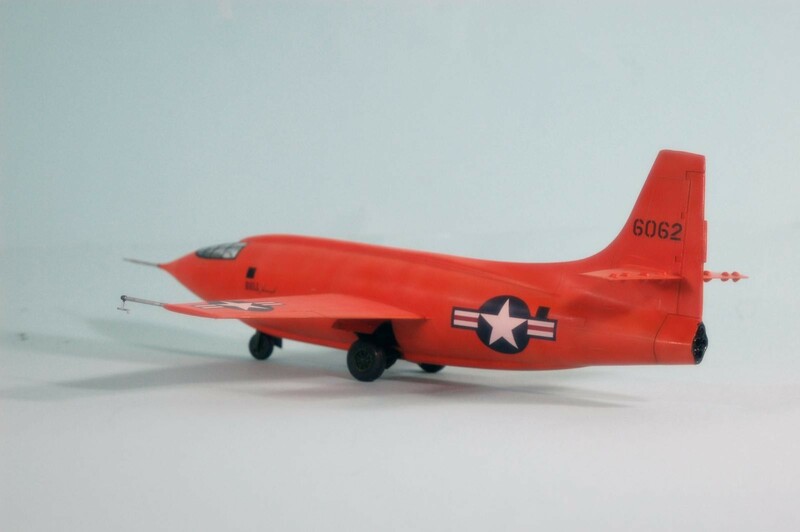 That ability gave the Sabre the edge it needed in combat with the MiG-15. 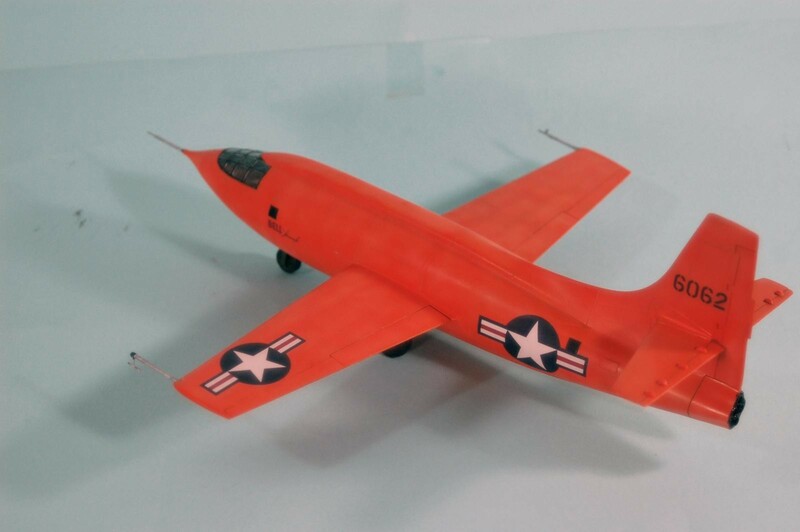 In 1952, an F-86E crash landed on a beach in North Korea. Soviet technicians worked through the night to disassemble the airplane as a US destroyer shelled the area to try and destroy the airplane. The Russians put the wreck on several trucks and were pursued by US aircraft (hiding in tunnels) until they crossed the Yalu. The Sabre ended up in Moscow, and to this day Russian supersonic aircraft use the same system that Sabre had. The model was resurrected from the Shelf of Doom, where it sat in its box for 15 years till I pulled it out two weeks ago and finished it. Tamiya paints, and the kit decals still worked. I’d known much of what you related in your narrative, and by the same token, NOT known much of it as well. I’d read both of his [Yeager’s] books (AND Anderson’s and Rall’s). I’d built the model depicted here (although not quite as well) – and the thing that I remember most about it was the excellent (or at least I think) pilot figure that came with that kit. Your insight is, to say the least, interesting. Thanks for sharing your memories. 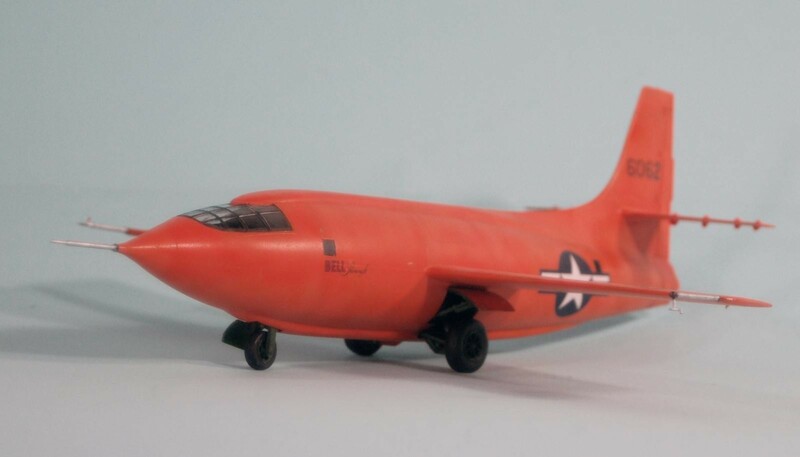 Ah, the Bell X-1, what’s not to like. The movie was top notch and I believe Yeager never got over the fact he wasn’t picked to be an astronaut. One of his combat buddies stated one of the reasons he was so successful as a fighter pilot was his eye sight. He would spot a flight of bogies way before anyone else saw them, and then set up a plan of attack. Tom, nice article on a poor boy from West Virginia that certainly made a mark on aviation history. What a fantastic narrative, the best of all I’ve read throughout your numerous articles. The fact that it’s a personal story only adds more interest to the whole thing. What a wonderful life experience you have Tom! Couldn’t have said it better Pedro. Great read as always Tom, and nice build! After many years of doing jobs everyone else I knew in my life thought were “good jobs”, 40 years ago I went in for my flight physical and the doctor told me “I don’t know what you do for a living, but if you keep on, you’re going to have an ulcer in two years and a heart attack before you turn 40.” That brought things into focus! Within 30 days, I had given notice at work (giving myself six weeks of scheduled work travel down to Los Angeles, to use the evenings getting my move organized) and had my then-wife announce that she didn’t like my decision not to do things that her parents thought were good. I still went. I started following full-time the things I had done part-time before, all of which I loved. Life since has been interesting, but not easy. However, the worst day since that decision has been better than the best day before. Excellent article Tom. Being somewhat connected to the Aviation industry, I too have heard some stories. Like the Pilot/Astronaut who is a real Jekyll and Hyde most of the time. Still, it’s sad when you realize your childhood Hero is not what you expected. To paraphrase, sometimes it’s just better to leave a sleeping dog alone. Very nice build and write up. I have this kit on my ‘doom’ stash as well. I’m thinking of doing it as an in-flight display when I get to it, ideally with the rocket motor displayed separately on the base. I, too, have heard all the stories about General Yeager and I just keep in mind he was human, complex as they are and was on all accounts one of the great pilots of the ages. I don’t know a single “creative original” who isn’t light/dark with little middle ground. Sinatra by all accounts could be a miserable SOB, but I listen to his music all the time. Picasso was by all accounts a monster in his relations with women. Art wouldn’t be what it is without his presence. Great story (and as others have mentioned, so cool that your connection is so personal)! Oh yeah – very nice model as well! Never knew it was designed from a bullet. You met and know Chuck Yeager. Nice build ! very interesting story. Good story. I’m pretty sure there was one thing a P-51 couldn’t do, that Marion Carl used to do regularly with a Bearcat: a loop immediately after gear up on takeoff. Clean build. I like the color. Orange is hard to make look right. Very nice build. Interesting article and subject matter. Great history and personal interest story. This model really pops and is a head turner. Need to build one myself someday. Very nice build and very nice story about Yeager. Helps explain some peripheral dealings I had with him back in the 1980’s. Sorry to hear about his declining health. S****y way to go.